But that trick doesn’t always work. Sometimes it’s not an emotional/goal issue that’s halted my story. Sometimes it’s plot-related, and I really have no idea what external event should be happening next. This problem tends to hit to me during the first 40-50K words of the novel (i.e., the first half). Why? Because up until the midpoint, the characters in a story tend to be reacting more than they are acting. Up until the midpoint, a lot of the events are dictated by the world in which the protagonists lives and by what the antagonist is doing. For example (and I warn you, there might be a few spoilers about to follow! ), in Something Strange and Deadly, much of where Eleanor goes and the events in which she finds herself are dictated by external forces. Her mother makes her go on a carriage ride with a suitor or attend operas, while the antagonist keeps popping up with an army of walking dead. Not until the midpoint (when Eleanor gets a critical piece of information and faces off with a creepy spirit) does she finally see how to shift the odds in her favor. After that, when the antagonist throws stones, Eleanor throws them right back. She’s on the offensive. And once my characters are on the offensive, I can usually ride my domino effect smoothly to the end of the book…One event clearly causes the next. But getting to that midpoint can sometimes be tricky for me. 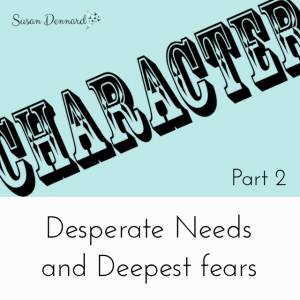 I usually have to slowly reveal information as my character uncovers it (and information can be so hard to reveal in a compelling manner), and I need to let my character’s grow–their flaws and emotional well-being needs to be constantly challenged as well. So coming up with events that both allow my protagonist to be active and still be learning/growing can be hard. I don’t mean my protagonist–I mean everyone else. When I’m stuck and don’t know what event and/or setting should next arrive, I turn to my secondary characters and my antagonists. Where are they right now? Where have they been since the last time I saw them? And what were all their emotional/goal dominoes throughout the previous scenes? Here’s an example that I wrote a few weeks ago. Simon is the love interest, and since one of my magical cookies in this story is the romance, I knew that I wanted to get Simon on the page with my protagonist…But for the life of me, I could not figure out how. So I started from Simon’s very first scene in the book and mapped out exactly where he was during my heroine’s scenes. And as I wrote out this stuff, I uncovered some REALLY cool and really unexpected things about Simon’s character–about his emotional growth and backstory. Once I reached the spot in which I was stuck, I could feel how Simon’s emotional dominoes would dictate what needed to come next for my protagonist. It’s not just the love interest that I do this trick with, though. I’ve also mapped my antagonist’s whereabouts/shenanigans and emotional dominoes in order to see what might come next in the plot. I might learn that my antagonist has been gearing up this whole time, and is now ready for an attack–so my next scene for my protagonist would become a run-in with the bad guy. Other times, I’ll move to other important secondary characters and see where they were and what they were doing. Almost always, I’ll eventually reach an “aha!” point and see exactly what event needs to come next. 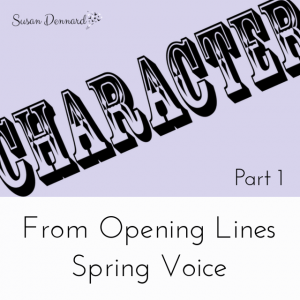 You tell me: Have you ever done something like this–looked at where your characters are behind the scenes? Or are you, perhaps wise, and do all this before/while drafting? Book Club Recap & Final Winner! I am at Dragon*Con right now–probably wondering the booths for a new Star Wars t-shirt–so I’ll keep this brief. 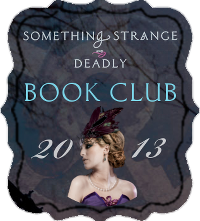 Thank you again to everyone who participated in the Something Strange & Deadly book club, both here and on Epic Reads. You all are truly quite amazing and I love you for it. Sara of the Page Sage! Thank you so much, Sara! And everyone else who joined in and was generally AWESOME throughout August. There are not enough ♥s to express how much I appreciate your interactions. To everyone who signed up for the participation prize: Because I am out of town for the next two weeks, it will probably take me a bit of time to get you your prizes (A Dawn Most Wicked or an extra scene from A Darkness Strange & Lovely). Please bear with me–I haven’t forgotten you!! And, in case you signed up but didn’t have a chance to participate, here’s a recap of all the month’s posts, discussions, and extra content. Enjoy! And again, thank you. I’ll be back to the blogosphere in 2 weeks. À bientôt!